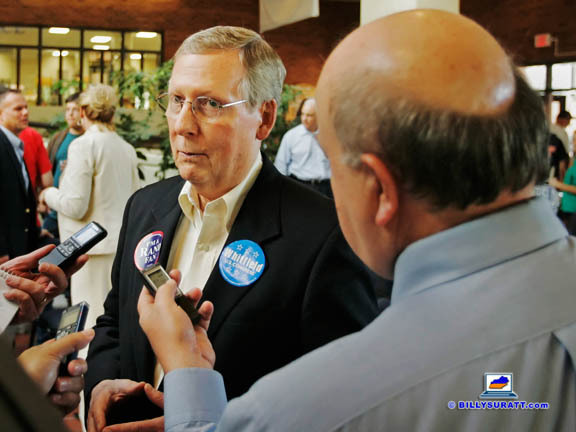 Kentucky’s 2014 U.S. Senate race between Republican Senate Minority Leader Mitch McConnell, Tea Party insurgent businessman Matt Bevin and Democratic Secretary of State Alison Lundergan Grimes — plus a few other candidates — is definitely shaping up to be a barnburner. Just how big is this race shaping up to be? In addition to some experts wondering if Kentucky’s television and radio stations might actually exhaust their entire advertising inventory before the race is over, evidently it’s also big enough for McClatchy to greenlight the Lexington Herald-Leader hiring an additional reporter to help Jack Brammer cover it from the newspaper’s Frankfort bureau. We’re looking for a reporter with solid digital and watchdog skills who is willing to experiment as he or she leads our coverage of what is expected to be the nation’s nastiest and most expensive U.S. Senate race in 2014, a wide-open race for Kentucky governor in 2015, and U.S. Sen. Rand Paul’s likely bid for the Republican presidential nomination in 2016. You’ll also play a key role in producing innovative coverage of Kentucky’s General Assembly and work closely with reporters in the McClatchy Washington Bureau to explain and analyze the political maneuverings of Kentucky’s federal delegation. This position requires a motivated individual with sharp analytical skills who understands how the game of politics is played and can lay bare its underbelly in thoroughly reported stories presented in an array of print and digital formats. Inspired writing that reveals, explains and analyzes information in an authoritative manner that moves beyond the institutional; Excellent source-building skills; An exceptional grasp of social media, video, blogging and digital storytelling tools; A team player who maintains a professional demeanor and positive attitude during an often intense work environment; Self-motivation that generates unique, plentiful story ideas and fuels a yearning to always be ahead of the pack; A desire to take risks and try new things while adhering to traditional journalism values of fairness, accuracy and ethical conduct. Ability to quickly curate news from state and national sources about Kentucky politicians using services such as blogs, Twitter, Rebel Mouse and Storify. Broadcast outlets running out of airtime to sell is one thing, but newspapers hiring additional reporters to staff a bureau? That’s downright wacky nowadays. A rare opportunity — not because it's a newspaper hiring instead of firing, but because the Messenger-Inquirer staff has little turnover.